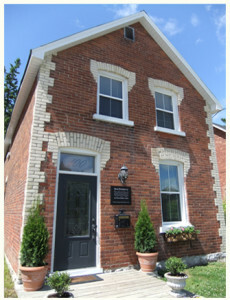 Making the leap from a home-based business to a commercial enterprise in the downtown was a big step for Christine MacPherson – especially when the focal point of those plans was the complete renovation and restoration of a crumbling century-old home. So, she and her husband, James Holmes, started searching for a commercial property that could become home to the MacPherson Communication Clinic. After a fruitless search, their real estate agent, Josie Manna, suggested a circa 1890s home that was for sale on Mississaga Street. “It was a wreck. But we could really see the potential here,” she said. What they could not see was the depths to which they would have to go to restore the once grand old home. When all was said and done, they basically gutted the home to the studs and started anew. But they were able to retain much of the home’s character: the old banister, the window moulding and the front door – which they lovingly restored and now stands as a focal point in the reception area. It wasn’t easy. When they got approval to change the designation of the building from residential to commercial it meant a whole host of alterations, both small and large were required – including bringing in engineers and replacing joists that no longer met weight-bearing rules governing commercial properties. As MacPherson leads a tour of her new home-away-from-home, it’s clear that it was worth every second – and every dollar – to do it right. And the design, while at once homey and functional, has more to do with her clients than aesthetics. For example, the building is fully wheelchair accessible with a comfortable and private first-floor meeting room that doubles as a boardroom-type space that can be used for team meetings, including all those involved in a client’s care. As important as the new facility is, MacPherson says about half of her work involves seeing clients in their homes. The other 20% of the clinic’s clientele is made up of children, teens and adults experiencing difficulties with speech, expression, listening, writing, reading and thinking. People with autism and Down syndrome are also clients. She has also helped people experiencing problems with their voices. “For example, I had a teacher who was losing his voice, which makes it awfully hard to teach,” she said. “So, we got him to do some voice exercises, changed the resonance and, working with his (ear, nose and throat) doctor, we were able to help him overcome this. Just don’t ask for singing lessons because I can’t carry a tune,” she said with a laugh. With a growing clientele and with her reputation spawning more work, MacPherson is no longer a one-person enterprise. Since moving and expanding, she has hired a clinic manager, Vanita Sadarangani, two communicative disorders assistants – Sasha Besley and Jenn Morrow – and another speech-language pathologist, Kelly Irving. And now, she’s looking for another speech-language pathologist for the growing business – a quantum leap from the days she operated by herself out of her home. “It’s funny, since we’ve opened here, I really feel like I’m grounded and I’ve really, for the first time, started to feel like this is home now,” said MacPherson, who left her native Australia with just a backpack to come to Canada in 1992 looking for a job. She found that job at Royal Victoria Hospital in Barrie, then met her future husband before deciding to settle in the Orillia area. That led to her 15-year solo practice that she operated from her home. In all, she has been working in the field for 22 years.